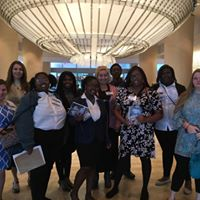 Cheraw High School's Future Business Leaders of America attended the National Leadership Conference in Charlotte November 16-18, where they heard inspiring keynote speakers Brandon White and Carlos Spencer, attended meaningful workshops, and networked with FBLA members from across the U.S. The conference helped students prepare for upcoming competitions, scholarship opportunities, and future careers. Students were also able to experience the commuter train system, tour Charlotte, and explore the Epic Center.